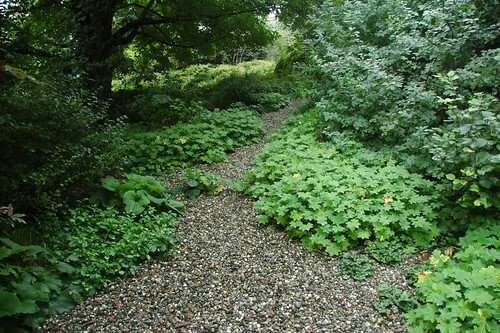 A path in the Brine Garden in Pawling in Dutchess County, NY, north of New York City. Last Sunday, Blog Widow and I drove up to Pawling, NY and spent the day with a friend of ours. I also got to meet Julia and Duncan Brine. 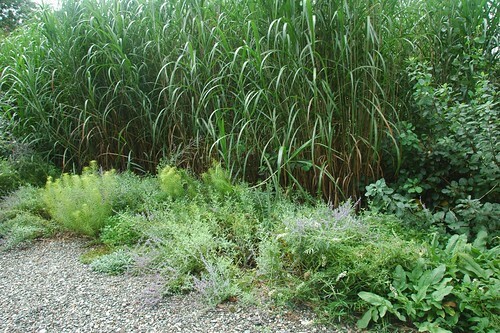 In their landscape design firm, they specialize in native plants, so I was excited to meet them and visit their gardens. The gardens ramble over six acres. In contrast to the familiar limitations of urban gardening, it may as well have been 600 acres. 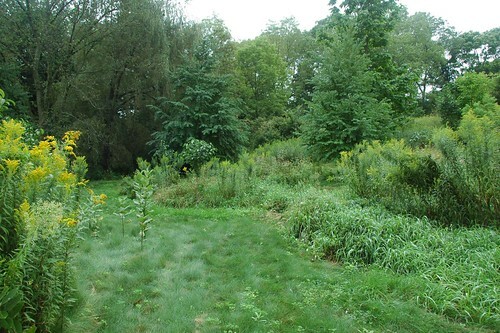 The property slopes, steeply at times, from the unpaved entrance drive down to Route 22. Water flows through the property. The day of my visit, precipitation seamlessly cycled through mist, drizzle, sprinkles. There was nearly a film of water over the gardens. I'm not exaggerating. My friend's sneakers became soaked just from walking through the long, wet grass. 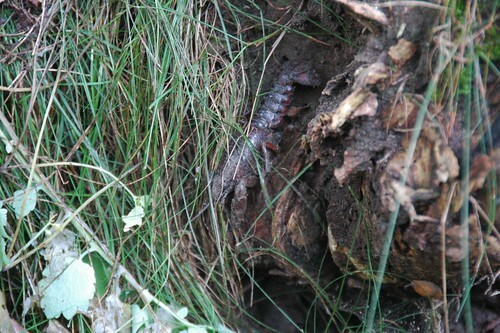 And it was wet enough for this fellow to crawl over the ground to his burrow of mud at the base of a log. With the almost constant rains we've had this summer, everything was lush, full, and green. The rampant growth encroached from all sides, overtaking and disguising any intended boundaries of the cleared areas. This contributed to the fluid expression of "path" at play in the Brine Garden. Narrows suggest passage; wider bays encourage a slower pace. 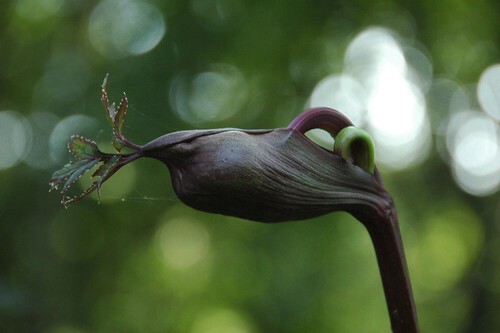 This Wednesday I take the final for the Brooklyn Botanic Garden's Herbaceous Landscape Plant Identification class. [Spelling counts! So please let me know of any typos.] Thursday, I start Urban Garden Maintenance, the last of the eight classes I need for my Certificate in Urban Horticulture from BBG. I started the program in Winter 2008. This is the home stretch; I can't believe I'm almost done with it. Unlike the "woodies" class, I already knew most of the plants introduced in the class over the past five weeks. 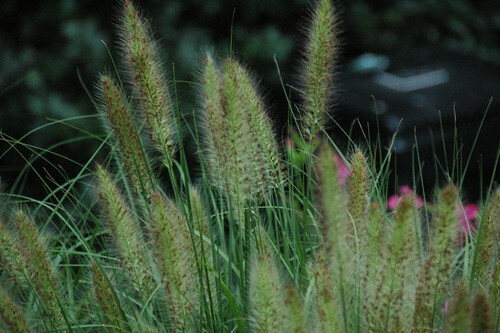 Either I've grown them myself sometime over my 30 years of gardening in NYC, or I've researched and studied them. 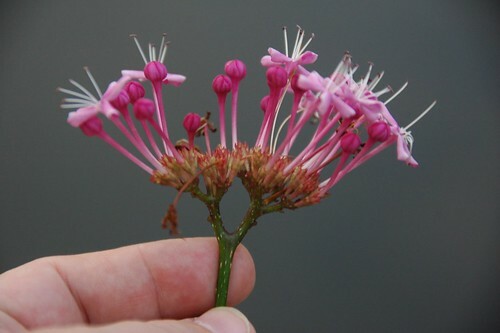 However, there have been several, such as the interesting Clerodendrum above, which I've never even heard of, or never knew the names of. This post is the index to my photographic study guide. 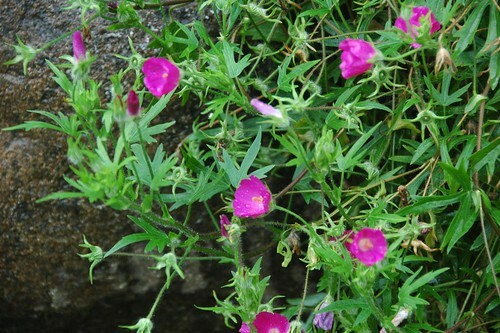 Plant names are listed by week, in alphabetical order by botanical name within each week. Botanical names are given, corrected for typos, as they were introduced in the class; that's what we'll be tested on for the final this Wednesday evening. Plant names are linked to my Flickr Set, where I have one. You can also browse my Flickr Collection for this class, where all the plants are listed by botanical name. Aquilegia canadensis, Columbine. 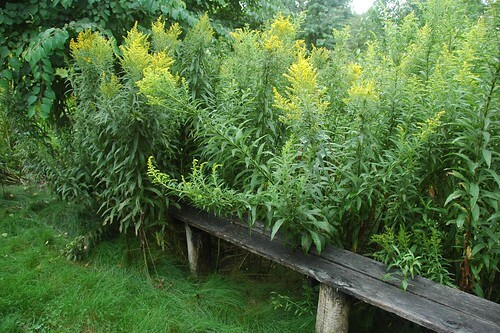 This grows as a Spring ephemeral in our region; none were available to observe at this late date. Geranium macrorrhizum, Bigroot Geranium. Omitted primarily for time constraints; also, it was out of bloom by this time of the year. Too bad, since it's a handsome plant, and there are lots of them around the grounds of BBG. We got 11 plants this week to make up for being two short the previous week. This was the only themed week of the class, consisting solely of grasses, ferns and fern allies. The last class before the in-class final. Although I've lived in Brooklyn since 1992, I didn't encounter Sphecius speciosus, the Eastern Cicada Killer, until we moved to Flatbush in 2005. It was summer, and I was working outside in the garden. Suddenly, here was the biggest wasp I had ever seen, large and loud, buzzing around my driveway and digging into the lawn next to it. I freaked out. I hosed out the burrow and destroyed the nest. I regret having done that. I attribute my over-reaction partially to the stresses of being a first-time homeowner. I now find them beautiful. I consider myself lucky that we live in an urban area where these specialists can thrive. Besides, they are much too busy during their short adult lives to bother with people. They have a fascinating, if gruesome by human standards, life history. It could easily be the inspiration for the xenomorph of the Alien movie series. After mating, the female digs out a deep tunnel leading to a multi-chambered nest. They're impressive excavators. 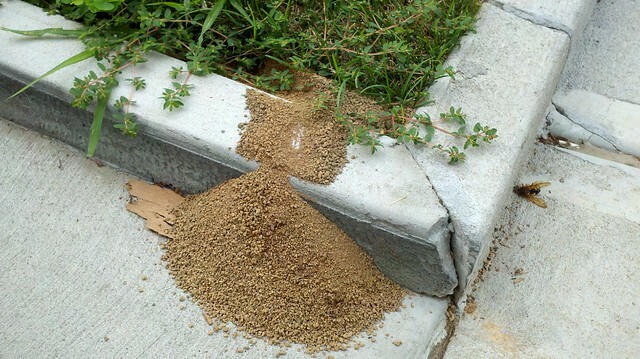 This debris pile appeared overnight alongside our driveway and sidewalk in August of 2012. The concrete curb is 3" high. 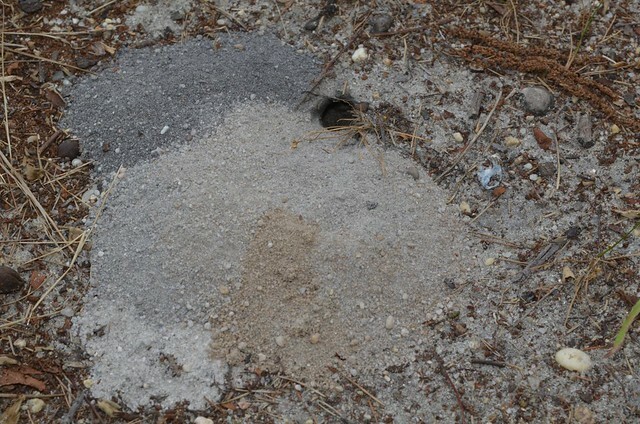 Here's the entrance to a nest in Cattus Island Park in Toms River, in the coastal pine barrens of New Jersey, in August of 2011. Note there are 4 different colors of sand, showing the different layers, and depths, the female reached. 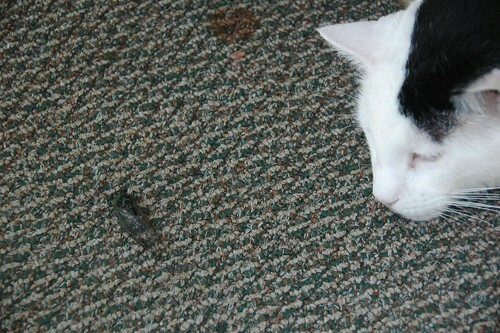 The female then hunts for and captures an adult cicada, paralyzing it with its sting without killing it. It returns with the cicada to its burrow, dragging it into one of the chambers of the nest. It lays a single egg on the cicada. It repeats this process several times. The female dies soon after egg-laying. 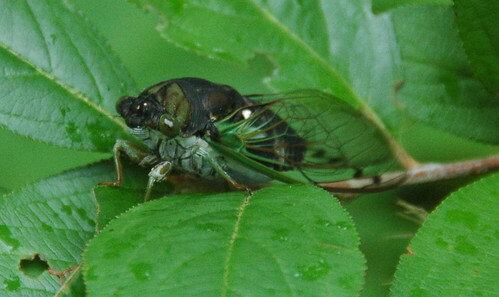 When the egg hatches, the larva feeds on the still-living cicada. When the cicada hs been completely consumed, the larva spins a cocoon and overwinters as a pre-pupa. In Spring it emerges from the cocoon as a pupa, eventually metamorphosizing and emerging as adults, male and female, for mating and renewing the cycle. 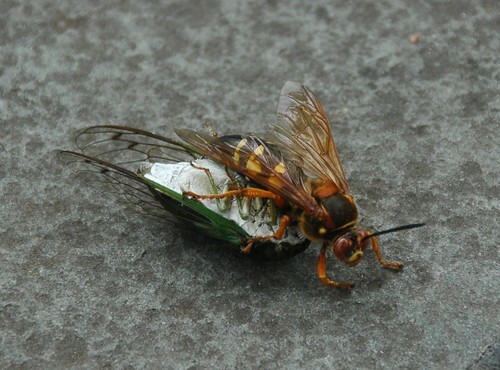 Cicada killers are solitary wasps. Males emerge from pupal cases in mid-July to early August, a few weeks before the females. The males tunnel out of the ground, leaving telltale holes, and select a territory that they actively defend. Females mate soon after emerging, and then begin digging burrows in the ground using their mandibles and legs. The burrows can be several feet deep with numerous branches. Once construction is complete, the female searches in trees and shrubs. Upon capturing a cicada, the female stings it injecting venom. Then, she carries the cicada back to the burrow, where she lays an egg on its living, but paralyzed body. Within two weeks, the egg hatches into a larva, eats the cicada, and develops into a pre-pupa, the stage at which it will spend the winter. 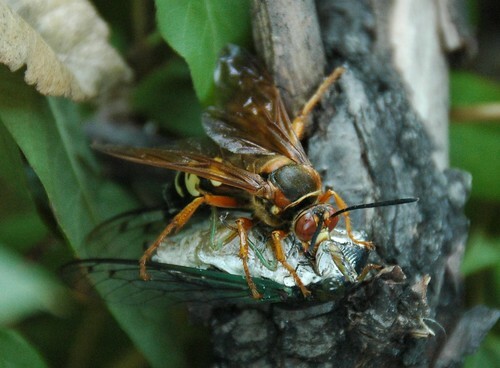 Cicada killers are active in late summer, the same time that cicadas are present. By September, most adults have died. Although visually alarming, these wasps pose little threat. Females are not aggressive and rarely sting, unless excessively provoked. Males often display territorial behavior and will dive-bomb people’s heads; however, they have no sting and pose no real threat. We seem to have an underground yellow jacket nest on our front walkway with a "Queen" that is about 2.5 inches long.....a little frightening to me but will absolutely scare the wits out of my kids- she looks like she can carry her own luggage! Anyone know an exterminator that can come and get rid of this Quick!? This beautiful creature is not a bee. 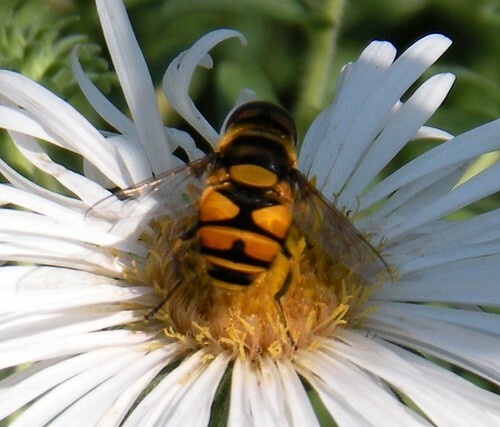 It's a fly of the Syrphidae, a family of flies renowned for bee mimics. 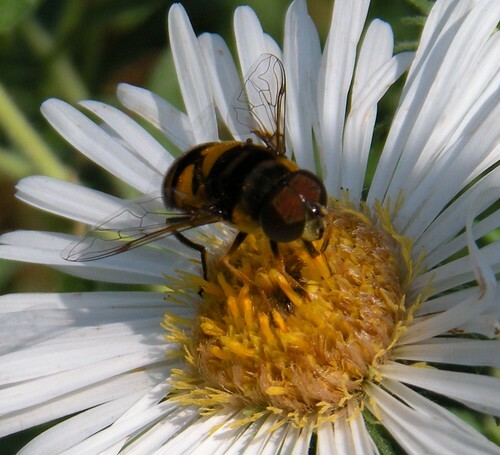 This is Eristalis transversa, Transverse Flower Fly. I had noticed it in my garden for the first time this summer. yesterday was the first chance I had to capture some photos of it. Consider this a belated Garden Blogging Bloom Day post, but with a native pollinator as the focal point. The flower it's visiting is Aster novae-angliae 'Chilly Winds', a selection of the native New England Aster from Seneca Hills Perennials in upstate New York. This plant has been a pollinator magnet in my backyard native plant garden for weeks. 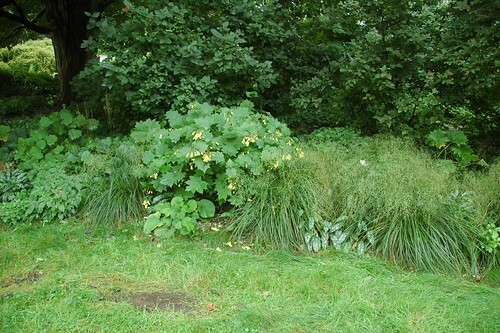 It's massive and overgrown and poorly placed, crowding out everything else around it. I'll have to find it another place for next year.